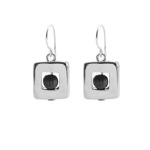 Elegant and sophisticated earrings essential for any jewellery collection. These stylish earrings are great for day or night. 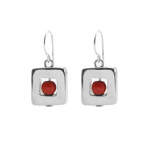 With a square setting and central coloured wooden bead, they offer a modern twist on more traditional silver-coloured earring designs. These earrings are dainty enough for work or day-to-day with a subtle hint of colour for you to express your personality. Wear them out in the evening to for subtle chic to unify your outfit or accentuate a colour. Made from sustainable wood, these eco-friendly earrings are available in vibrant red, rich purple, apple green and chic black. Choose the black earrings to add understated feminine glamour to your work clothes or dark suit; opt for the apple green earrings to enliven your look day-to-day or for your summer holidays; or go for the purple earrings or red earrings to create an impact at formal occasions or evenings out.